In Reginald Owen’s Christmas Carol, the story opened not with Scrooge in his counting-house, but with his nephew’s meeting a couple of Bob Cratchit’s kids on the street. We got to see how good-natured Fred is and – through his conversation with Peter and Tiny Tim – learned a little about what people think of his Uncle Scrooge. After leaving the boys, Fred continues his walk towards Scrooge’s office, grinning at shoppers and cheerfully brushing snow from his coat after being knocked into a snowdrift in the last scene. He soon arrives at the building with the Scrooge & Marley sign and it’s humanizing to see him pause to look up at the sign and collect himself. He looks worried for a second, but then visibly shakes it off, smiles sadly, and goes inside. He doesn’t burst in and force his cheerfulness on the place. He opens the door and Cratchit – who’s sitting right there – doesn’t even look up. He sort of half-acknowledges that someone’s just come in, but doesn’t turn to see who it is. When Fred calls him on it and asks, “Aren’t you going to wish me a Merry Christmas?” Cratchit looks stressed, but tears himself away from his work to greet his visitor. He quickly explains that he thought it was Scrooge coming in, implying that he was trying to look busy. A quick word about Gene Lockhart, who plays Cratchit in this version. Not a thin man. I like his performance quite a bit – his Cratchit is persecuted, but refuses to lose his Christmas spirit – but it kind of goes against the idea that he’s so poor when he looks so well-fed. Fred and Cratchit exchange Christmas greetings and Fred explains that he’s already seen Peter and Tim. He passes along the grocery list that they asked him to deliver to Cratchit, which embarrasses the clerk a little, but Fred says that he was pleased to do it. Fred notices how cold it is in the room and wonders about the small fire. I like that there is actually a small fire in Cratchit’s room. It’s obviously not big enough to warm the area, but it’s not so small as to be humorous. Fred says that he foresaw the need for warmth at Scrooge’s and provided for it. Eyes sparkling, he produces a bottle of port from his coat pocket. You can probably tell that Barry MacKay is my favorite Fred. He remains consistently cheerful and charming throughout his performance without ever becoming obnoxious with it. I want to celebrate Christmas with his Fred. When he and Cratchit realize that they don’t have a cup to drink from, Cratchit is emboldened to go get one from Scrooge’s office. Fred sniffs it when Cratchit hands it to him and turns up his nose. “What is this?” he asks. The merriment makes Cratchit even more brave and he declares that they will have some more coal for the fire. Egged on by Fred, he goes back into Scrooge’s office and emerges with a heaping shovel full of coal that he throws onto the fire. As Scrooge silently closes the door, Fred puts the wine bottle on Cratchit’s desk with a bemused look on his face that says, “Oh crap. We’ve been caught.” Cratchit, of course, is considerably more worried. As Fred reaches to shake hands with his uncle and wish him a Merry Christmas, Cratchit sets down the glass and hurries to the fire to pick out as much unburnt coal as he can with his poor hands. Scrooge, calling Christmas a humbug, walks into his office, casually noticing what Cratchit’s doing as he passes. Fred follows Scrooge into the office and the conversation continues. Scrooge takes off his hat and coat, revealing a ridiculous tuft of hair on top of his bald head. I’ve always assumed this a bad bald wig, but it does make Owen’s otherwise powerful Scrooge rather pitiable, so maybe it’s intentional. 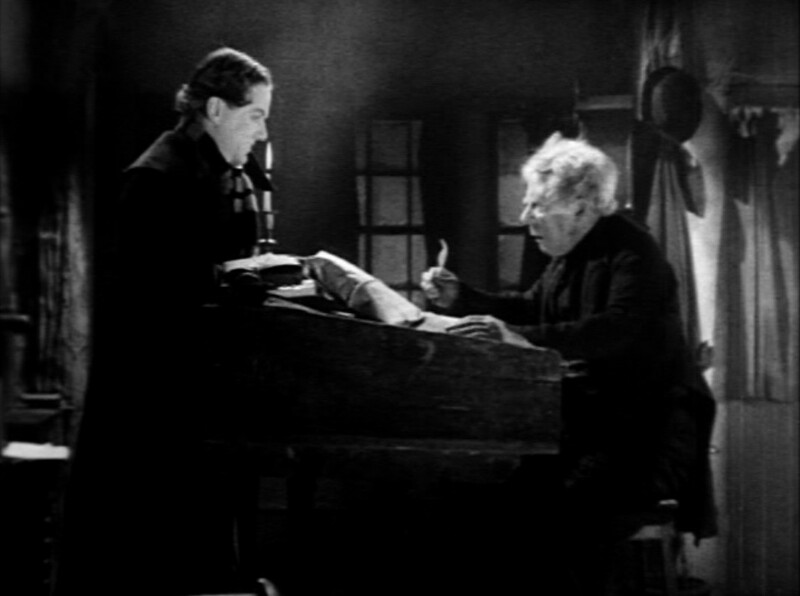 The conversation goes more or less as Dickens wrote it, with Scrooge’s continuing to settle into his office throughout. I love the staging here. It’s not just Scrooge and Fred talking to each other over a desk. They’re both moving around the room the whole time, giving the scene energy that it doesn’t usually have in other versions. 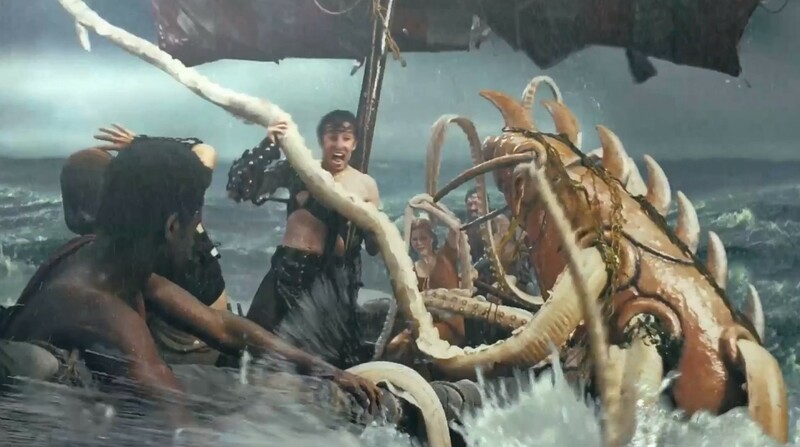 I wonder if that’ll continue throughout the movie. When Scrooge says that he’d like to bury Christmas celebrants with a stake of holly through their hearts, he means it. Owen’s Scrooge shows none of the subliminal humanity that Seymour Hicks gave his version. At least, not at this stage. Scrooge looks pissed. “Nephew!” He’d physically remove Fred from the building if he was strong enough. Since he’s not, he orders Fred to let him keep Christmas in his own way. The conversation seems to be over, but as an afterthought, Scrooge looks back at Fred and says, “Much good it has ever done you.” In the novel, this flows naturally out of Scrooge’s last comment, but the way it’s done here, Scrooge has suddenly re-engaged with the discussion. We’re not sure why. Probably, he’s still angry and is just being mean. There’s something in his eyes though – and maybe I’m reading too much into it or seeing softness that isn’t really there – that makes me wonder if he’s not challenging Fred to convince him. If so, Fred rises to the challenge. His “It has done me good” speech isn’t word-for-word what Dickens wrote, but it captures the spirit well enough, assisted by sentimental, heavenly background music. MacKay’s delivery of the speech is skillful. It’s gentle and warm; never cloying or cheesy. Scrooge really does visibly soften during this. He keeps trying to turn away, but can’t. And while he’s drawn in to Fred’s speech, he can’t maintain eye contact the whole time. This is a Scrooge who’s bitterly angry about the world, but searching – deep, deep down – for a reason to engage with it. We also get a shot of Cratchit, listening gratefully from the other room and being emotionally stirred. By the end of the speech, he’s clapping enthusiastically. Like in the novel, he suddenly realizes what he’s doing and rushes from his chair to go poke the fire. He doesn’t extinguish it the process – probably because it’s still got some of that extra coal on it – but it’s still quite funny thanks to Lockhart’s comedic ability. 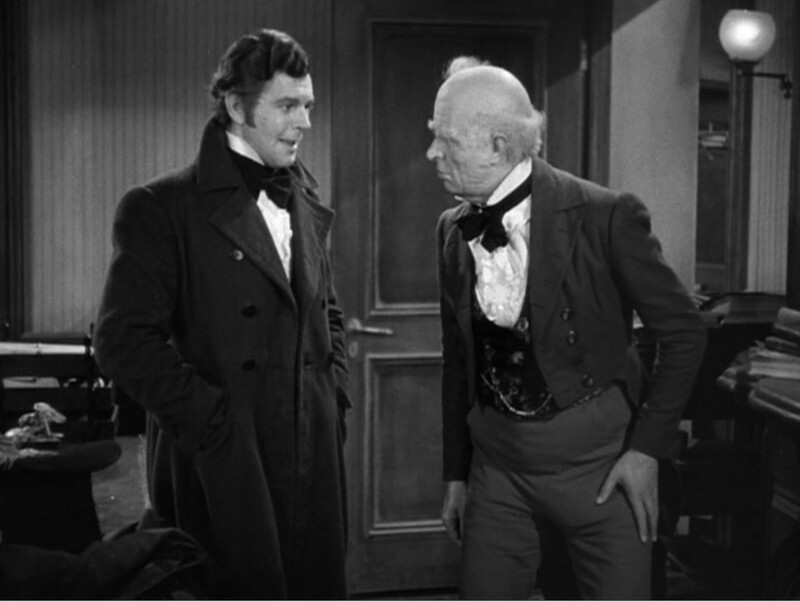 Scrooge, already looking for a way to escape Fred’s speech, comes into Cratchit’s room and threatens his job. Cratchit seems genuinely concerned about the threat (this is the first he’s received in this version) and can’t get back to his desk quickly enough. Scrooge doesn’t seem to know who Bess is, so Fred clarifies that she’s his fiancé. He also reveals that he’s dining with “her people,” but that he’s sure they’d welcome a visit from Scrooge as well. Scrooge expresses surprise that Fred’s engaged, so we skip the whole “I’ll see you in Hell” part. Instead, the conversation goes immediately to why Fred’s getting married. Fred’s being engaged instead of already married is a significant change from Dickens’ text. As is Scrooge’s ignorance about the relationship. It eliminates that as a reason for Scrooge to be angry at Fred. In fact, Fred would please the literary Scrooge when he says that Bess and he are waiting to be married until after Fred can afford to support her. Another change is that Scrooge hasn’t yet declined the invitation, having been sidetracked by Fred’s news. Nor is there any indication that this is an annual request. The implication is that Fred’s inviting Scrooge because he’s recently engaged and wants the families to meet. Scrooge suspects other motives though and accuses Fred of wanting money so that he can get married. Fred laughs and says that wasn’t it, but Scrooge doesn’t believe him. “Good afternoon,” he says, picking up Dickens’ version of the conversation. Fred – refusing to lose his cool – laughs heartily and tries to part on friendly terms, but Scrooge keeps good-afternooning him until he gives up and leaves, pausing to exchange some last, warm wishes with Cratchit. On his way out, he has the opportunity to wish a Merry Christmas to two other gentlemen who are just coming in. After a dismal first scene in which Scrooge threatens his clerk’s job over the shovel-full of coal (“It is very evident to me, sir, you know, that my interest is not your interest, nor my welfare your welfare.”), we cut to the street outside where a gentleman carrying Christmas bundles is walking along to a merry little marching tune. He stops to buy something from a street vendor and then goes inside to Scrooge’s office. It’s the nephew, of course. He barges in and surprises Scrooge who looks shaken by the abrupt interruption. As the conversation begins, he lays his packages right on Scrooge’s desk, though he doesn’t seem to disrupt the papers that Scrooge is working with. The dialogue is all right out of Dickens, slightly abridged (especially during the nephew’s speech at the end) and with a few improvisations (“not a penny richer” instead of “not an hour richer,” for instance). The nephew isn’t overly jolly – he seems to know he’s in for a battle and is prepared for it – but he’s cheerful and even keeps his sense of humor when Scrooge intentionally knocks one of his packages off the desk (to punctuate his comment about paying bills without money). The camera stays on Scrooge most of the time, allowing Hicks to seem genuinely bewildered and frustrated by the merry-making. When he says, “Keep Christmas in your own way, and let me keep it in mine,” he looks almost hurt that he’s being so imposed upon. Hicks humanizes his Scrooge, breaking eye contact after lines like burying celebrants with a stake of holly through their hearts, as if he’s realized he’s gone too far, but isn’t willing to take it back and weaken his position. It’s really a lovely performance. After the nephew’s final speech, Cratchit “applauds” by tapping on his candlestick and proclaiming, “Hear! Hear!” a couple of times. Unfortunately, the adaptation leaves out the bit about his quickly correcting himself and accidentally extinguishing his fire. As Scrooge turns to threaten Cratchit’s job again, his nephew takes the opportunity to gather his packages. He’s got them all organized and is leisurely making his way towards the door by the time Scrooge returns his attention to him and “compliments” him on the power of his speech. When the nephew invites Scrooge to dinner, Scrooge replies, “I’ll see you — ” and is quickly interrupted by the nephew’s asking him why not. Was mentioning Hell a no-no in 1935 the way it was in Dickens’ day? We get no help from this scene in determining why Scrooge dislikes his nephew so much. He offers the marriage as an excuse, but they keep the line about Scrooge’s attitude’s predating the marriage, so it’s still a mystery for now. In the novel, Scrooge sticks to “Good afternoon” as his comment to the nephew’s continued good wishes. In this film, Scrooge adds a final, “You’re a noisy devil! That’s what you are, sir!” It’s almost affectionate if Scrooge didn’t sound so sincere. The movie of course fills in the nephew’s good-byes with Cratchit. They’re pretty generic, but we do learn the nephew’s name through Cratchit’s inclusion of “Mrs. Fred” in his greetings. Fred throws a couple of more “Merry Christmas”es at Scrooge – which go ignored – before he leaves. For some reason, Thomas Edison’s silent film puts Scrooge’s nephew after the visit from the Charity Relief Committee. It’s not the only version to do that, so there must be a reason for it, but I sure can’t figure out what it is. After Scrooge kicks the Committee out of his office, a title card tells us that “His nephew calls to wish him a Merry Christmas.” By the time we cut back to the action, the nephew’s already halfway through the door. Scrooge doesn’t seem to see him though (or is just ignoring him) and continues working. He doesn’t look up or turn around until his nephew’s standing right over him, but his attention could also have been gotten by the large, boisterous group of people coming through the door next. The nephew, it seems, has brought friends (two women and a gentleman). And they’re in a great mood. The nephew tries a couple of times to shake Scrooge’s hand, but Scrooge ignores it, seeming much more concerned about getting this rabble out of his place of business. He shows them out and then bows towards his nephew to indicate that he can follow them. The nephew tries once more to shake Scrooge’s hand, but this time Scrooge outright refuses. Scrooge closes the door behind his nephew and takes the time to shake a cane at the party through his window. Scrooge’s nephew seems jolly throughout most of the scene, but he’s somewhat deflated by his uncle’s rebuffing as he leaves. I’m not sure what the deal is with his bringing an entourage. I had a nice little theory about his bringing friends in hope that Scrooge will see that he’s honestly wanted by the entire group for Christmas dinner. That falls apart though because there is no actual dinner invitation in this version. As presented, the nephew’s just barging in on Scrooge’s workplace with his rowdy friends and Scrooge is perfectly justified in throwing them all out. This is supported by the end of the film when Scrooge goes to visit his nephew. We’ll see the reason for the visit when we get to that scene, but there’s no dinner or party involved. Which boils the current scene down to Scrooge doesn’t like his nephew and his rowdy friends. Marry that up with Scrooge’s fussing at his clerk and refusing to help the Charity Relief Committee and you’ve got a clear picture that Scrooge isn’t easy to get along with, if not exactly a reason why that is. Since we don’t get to hear any of the dialogue in this scene, we don’t learn anything new about Scrooge’s relationships with his clerk or nephew. 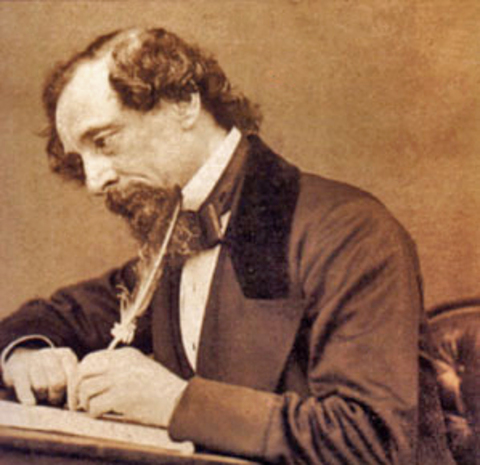 Borrowing from Siskoid’s format on his Hamlet blog, as we look at Dickens’ text, I’m going to copy out the entire text of the section in italics and insert commentary. That’ll help identify elements that we want to pay attention to in the adaptations. I like the suddenness of the nephew’s introduction. Some of the adaptations imitate this by having him burst through the door unannounced, but I think I recall a couple having Cratchit see him coming up the street through the window. Let’s keep an eye on that. The famous line. There are some famous quotes in pop culture that were never actually uttered by the people they’re attributed to (“Beam me up, Scotty” and “Elementary, my dear Watson” being two), but it’s nice to know that this isn’t one of them. Scrooge’s nephew is full of life as he’s depicted in most of the adaptations. A couple of them turn him into a sentimental fop, which is a crime. The George C Scott version is the worst of these offenders. I’ll be sure to point these out as we go. Burn! It’s lines like this that make me love Dickens. This speech is usually abridged in the adaptations. Though I’ve always loved it regardless of how it’s trimmed, I especially like the “fellow-passengers” bit that gets cut out. Nowhere is the reason for Dickens’ love of Christmas made clearer than here. This is the second time Scrooge has threatened his clerk’s job in the story. One wonders how often he normally did that in the course of a day. I wonder if Cratchit took it to heart every time or if he’d grown used to it as an empty threat. Might be interesting to watch how the actors portray his reaction. I love the lengths to which Victorian writers went to avoid swearing. I don’t remember which adaptations include this part, so that’ll be interesting to see. I’ve often wondered what the real beef was that Scrooge had with his nephew. Alastair Sim’s version suggests that Scrooge blames him for the death of Scrooge’s sister, who died in childbirth. I don’t recall that being part of Dickens’ text, but we’ll see. This line about the marriage seems to reveal the true reason. I operated for years under the assumption that Scrooge thought his nephew married beneath him, but that doesn’t make a lot of sense. Scrooge’s family doesn’t seem to be especially well-connected or privileged, so the bride’s social status probably isn’t the issue. More likely it’s that Victorians didn’t consider it wise to get married before you had sufficient income to support a family. Indeed, we’ll see later that Scrooge waited before proposing to his sweetheart. He thinks his nephew is foolish and has now got himself into the position of needing money. Which, Scrooge suspects, is the real reason for the nephew’s cozying up to him. Maybe there is something to the idea of Scrooge’s blaming his nephew for his sister’s death. 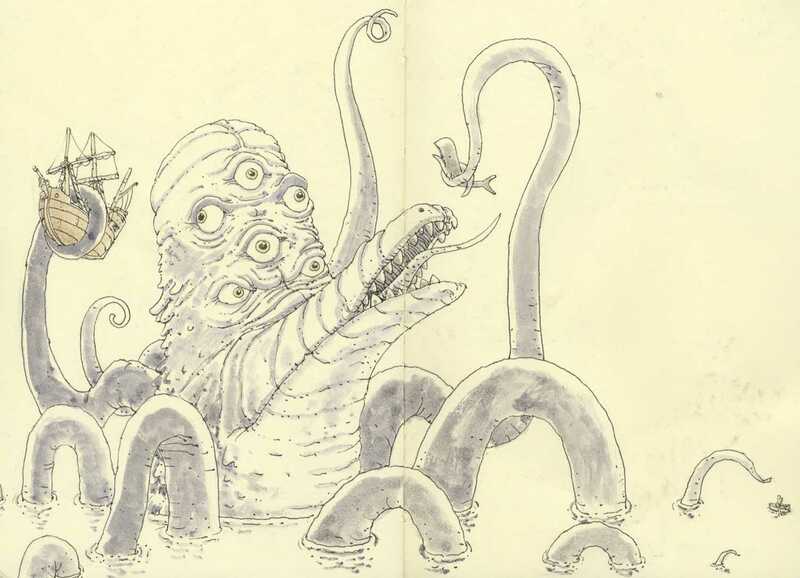 Seems to be a bit of a mystery here and I don’t remember how/if the text reveals it. According to the annotated text I’m using, fifteen shillings a week was a common wage for clerical workers at the time. Some of the adaptations try to draw humor by making Cratchit’s pay ridiculously low, but that’s apparently not the actual case. Bedlam, of course, was an insane asylum, but I’ve also learned that it’s short for Bethlehem, as in the Hospital of St. Mary’s of Bethlehem, which was the formal name of the place. We’ll stop there. We learn in the next paragraph that “this lunatic, in letting Scrooge’s nephew out [curiously unnamed in this scene, though we later learn that he’s called Fred], had let two other people in.” So we’ll cover them in their own section next year. Is the nephew’s personality jolly or sentimental? How funny is Cratchit’s applause? What seems to be the reason for Scrooge’s intense dislike of his nephew? A couple of years ago, I started a second blog to take an in-depth look at everyone’s favorite Christmas/ghost story, Charles Dickens’ A Christmas Carol, with the goal of paying attention to the way Scrooge’s story has been interpreted and adapted to other media over the years. Obviously this isn’t an exhaustive list. I started with my favorites, added some that people have recommended to me over the years, and then threw in some others that just caught my curiosity. We can talk about the ones I left out, but I will say that Mr Magoo’s Christmas Carol isn’t here because I hate it with a passion. It’s neither a good Christmas Carol nor a good Mister Magoo cartoon. There’s also no Scrooged or An American Christmas Carol or Ghosts of Girlfriends Past. When I first started this, I tried to stick to more-or-less faithful adaptations, but even though I’ve since added Teen Titans to the list, I’d rather that be a fun exception and not have to figure out where I’m going to draw the line. This is going to take years. Every December I’ll talk about one scene; starting with Dickens’ version, then looking at the adaptations of that scene in the days leading up to Christmas. 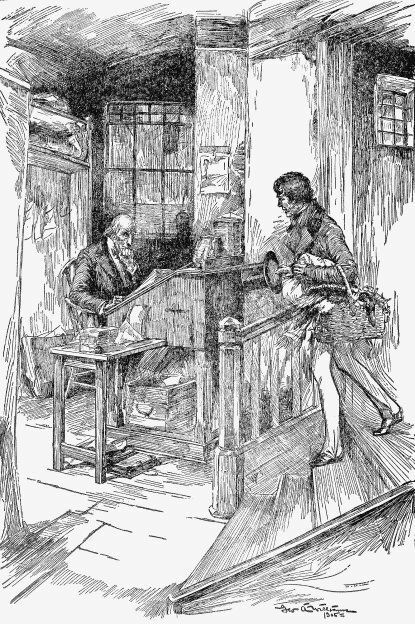 Last year, we let Dickens introduce the miserable old sinner and his poor clerk. This year – starting Monday – we’ll meet Scrooge’s nephew.